While researching The Philadelphia Story, I came to the startling realization that I had never seen any of Katharine Hepburn’s work. Despite 51 films to her name, the incredibly well-regarded actress had somehow eluded me over the years. It was perhaps fitting that The Philadelphia Story became my first Hepburn film, as not only was this her first big hit, but the screenplay was written specifically for her. Hepburn stars as Tracy Lord, a wealthy, strong woman who is getting ready to marry a lower class — but on his way up — gentleman named George Kittredge (John Howard). Just days before the wedding, a publisher at Spy magazine gets the idea to cover the wedding, and he assigns reporter Macauley Connor (James Stewart) and photographer Liz Imbrie (Ruth Hussey) to write the story. Their introduction to the wedding comes via C.K. Dexter Haven (Cary Grant), who just so happens to be Tracy’s ex-husband. With the introduction of these unexpected patrons, not to mention appearances from members of Tracy’s eccentric family, the pre-wedding weekend suddenly becomes a lot more complicated. It doesn’t help that there is an underlying unsettled romance between Dexter and Tracy. Their marriage was rocky at best, but there is still a clear connection between the two. Further difficulties arise when Tracy begins to discover some of Connor’s more appealing traits (apparently she is a sucker for good poetry). Now, the day before her wedding, she finds herself in a bit of a love triangle. While Katharine Hepburn is very much the center of the film — and she delivers a phenomenal performance — she was fortunate enough to be paired with the unbelievable 1-2 combination of James Stewart and Cary Grant. Stewart is as charming as ever, and he has a lengthy section in the film where he is flat out drunk — played with sterling effectiveness. Grant seems keen to stay in the background (surprisingly), but he is crucial to many important moments in the film. Special mention must also be made of Ruth Hussey, who delivers a strong performance that is unfortunately often overlooked when compared with the three leads. For all its star power, The Philadelphia Story is backed by a sharp, witty screenplay that ultimately won an Oscar (the film itself received six nominations, winning two). The dialogue moves at a brisk pace with plenty of snappy one-liners, though there were a handful of lines with dated 30s/40s slang that had me scratching my head. Even if I didn’t know exactly what something meant, I was able to understand it somewhat thanks to the conviction these lines were delivered by the strong cast. Ultimately, this is a clever little film with plenty to like. It would have been hard to mess up a film with the trio of Hepburn, Stewart and Grant starring, and thankfully this lives up to its classic billing. Consider me a new fan. Yep, it’s what I’d rate this one, too. Fine look at this one, Eric. Thanks, Michael. Glad to hear you’re a fan as well. This is a classic and I am pleased to see someone review this one so well. Thanks, T. I’m glad I was finally able to see this. Thanks, Scott. It’s well worth seeing. Haha, I know! I’m going to make a greater effort to see more of her work. Really enjoyed your piece, BTW. Thanks for sharing! Excellent write up and perspective! 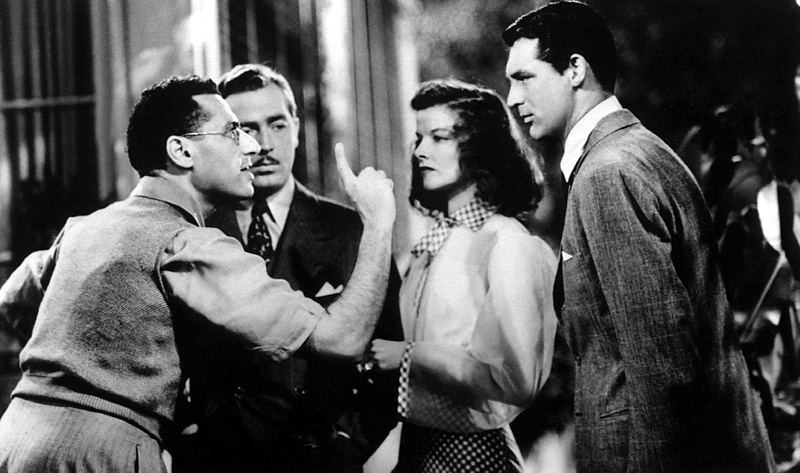 Cukor’s ‘The Philadelphia Story’, besides being a great comedy has always struck me as a test bed for Howard Hawks’ later teaming Grant and Hepburn later in ‘Bringing up Baby’. Still enjoy the late night sit down between Grant and an obviously drunk Jimmy Stewart. Thanks, Jack! Bringing Up Baby is high on my to-see list. If I don’t get to it sooner, it will certainly be included in next year’s project. BRINGING UP BABY (1938) came first. Also in 1938 Cary Grant and Katharine Hepburn had made HOLIDAY (http://thegreatkh.blogspot.co.uk/2012/06/holiday-1938.html) and before that they had made SYLVIA SCARLETT (1935) (http://thegreatkh.blogspot.co.uk/2012/06/queer-film-blogathon-2012-sylvia.html). 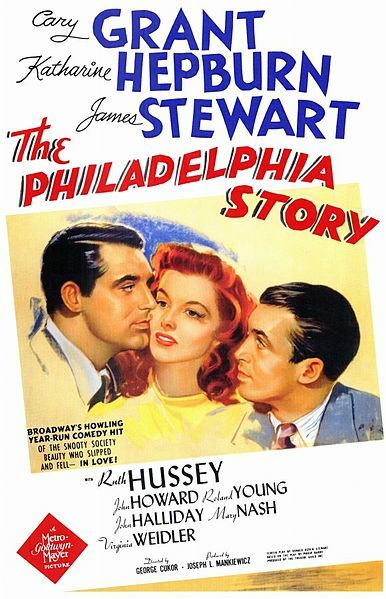 THE PHILADELPHIA STORY (1940) (http://thegreatkh.blogspot.co.uk/2012/05/philadelphia-story.html) was the last of the four films Grant and Hepburn made together. SYLVIA SCARLETT is a bit odd, but I can highly recommend the others. Oh wow, can’t believe this is your first Katharine Hepburn film, that’s just crazy. My love affair with old movies started watching TCM on the weekends with my dad. My classmates and peers had no idea who she, Cary Grant, Audrey Hepburn, Clark Gable, Marlene Dietrich, Mae West, or Ingrid Bergman were; honestly, I felt bad for them, they missed out on some amazing movies. Yeah, I feel the same way now. I didn’t start digging into the classics until 2-3 years ago, so I still have a lot to catch up on. These projects are a good way to get me up to speed, but yeah, I have no idea how I glossed over Hepburn’s films. She’s a joy to watch, I’m sure you’ll like the other films she was in. At one point she was actually considered box office poison, glad that notion was scrapped. Good review, Eric. This has been on my to-see list for a while, and I didn’t even realize it had both Grant and Stewart in it. That’s a heck of a combination even before factoring in Hepburn. Thanks, Morgan. The acting in this one is impeccable, but you can’t really go wrong with any of the leads. I think you’ll dig it. I LOVE this movie. It’s one of my favorite romantic comedies of all time. Everything about it works most notably the incredible work from it’s cast. Good stuff! Hi Keith, thanks for stopping by! Definitely agree with you on this — it was a fun watch, especially when the three leads were playing off each other. Glad I finally got to see it.